This was a terrible PPV. They put off having Daniel Bryan surrender the title. His wife quit. It was stupid. The main event was just another match between Evolution and The Sheild. All Triple H is trying to do is have all the established stars put over all the NXT rookies. Its boring and lame. All they have John Cena do is fight the Wyatts. Every Monday night they fight again in one way or another. Cena beat him at Wrestlemania and surprise he beat him again at Payback. Paige hasn't been given a decent match in the WWE. AJ dropped the belt to her on Raw in a 5 second match. Since then she beat every Diva easily. Except when Raw was in England where Paige is from. That night she lost her only match to Alicia Fox. Why do they always do that, punish the wrestler and the fans and make them lose in their hometown? Paige lost in England. Wade Barrett didn't even get a match in England. Dolph Ziggler just lost this past Monday in the opening match to Seth Rollins in Ziggler's hometown of Cleveland. What a joke. The Ussos won the Tag-Team Championships and have yet to defend them. The only tag-team match on the PPV was Rybaxel vs The Rhodes. It was a good match. Rybaxel won. They should clearly be the tag-team champs. But instead the Ussos still have the belts even though they just help Cena beat the Wyatts every night. 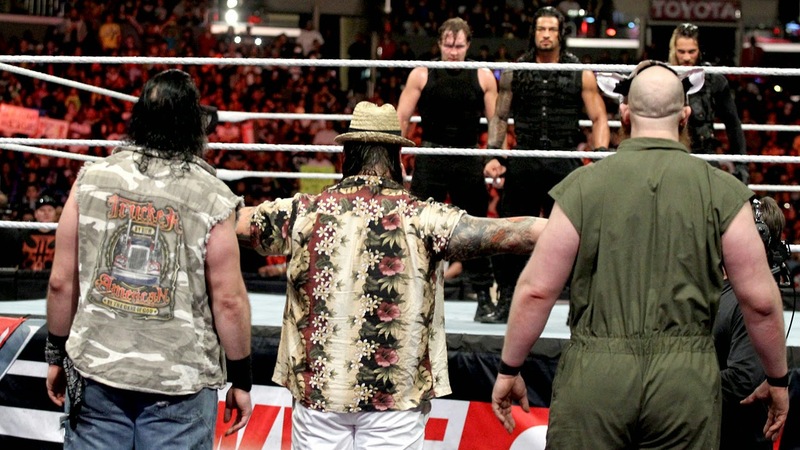 But clearly the build up was for the Ussos to drop the belts to the Wyatts at the next PPV. I get the feeling Triple H saw how the crowd reacted to the Wyatts vs The Sheild and he wanted to be a part of that huge exciting match. But he ruined it. He took the Wyatts out, put them with Cena, and brought back Evolution just to lose to the Shield and then break up yet again. Wow, what a joke you are Triple H. He also just had to force himself into the main events of Wrestlemania with a match against Daniel Bryan. I got news for Triple H, beating you doesn't make anyone a star anymore, you have been a loser for so long beating you is just as exciting as beating Heath Slater! So Payback was nothing more than a set-up for the following PPV which is Money In The Bank. And instead of having a ladder match for the Money In The Bank briefcase they are just having a championship ladder match. Not quite the same thing. HERE IS WHAT THEY SHOULD HAVE DONE!!!!!! Stephanie and Triple H strip Daniel Bryan of the title, which they have done now, but they should have done it a month ago, before Payback. Award the Champioship belts to Kane because he was the one that broke Daniel Bryan's neck. Act like that is what you asked him to do, and as a reward for doing it sucessfully you are giving him the belts and making him the new Champion! Its about time Kane got to hold the belt again! Then announce that at Payback Kane will defend those belts against every member of Evolution. They all deserve title shots. Plus it looks like evil Triple H is stacking the deck and hogging all the main events and title shots for his buddies. It would make them all hated, huge heat, and Triple H would be the most hated. Even more than he is now. Then at Payback shock the world. Have the biggest title match PPV of all time. Remember when Cena was out with an injury and Orton was awarded the title? Triple H challenged him in the opening match and won the belt. The Triple H had to defent the title in the mid card against Umaga. Triple H. Then in the main event Orton cashed in his rematch in a last man standing match. Best show ever! Check it out, No Mercy! So at Payback, the opening match is Kane defending the title against the man that lost the belt at Wrestlmania and never got his rematch, Randy Orton. I would have Orton win the match and win the belt. The crowd would be shocked and excited. But then, in the middle of the show, Batista comes out demanding his title shot. Batista won the Royal Rumble, but never got a one on one title match and never won the belt. So Orton would come out and defend the belt against Batista. I would have Batista win the match and become the new Champion! That would cement his return / comeback. He won the Rumble, main-evented Wrestlemania, and then finally won the belt. The triple crown lol. Of course that would not be the end of the show. Triple H would come out in the main event and challege Batista for the belt and for the first time ever Triple H would finally beat Batista for the belt. The show would end with Triple H as the new WWE Champion / World Champion. Adding another title reign to his resume bringing him one step closer to going ahead of Ric Flair as the most championships ever. Kane should make his match with Orton an Inferno match! I think Batista and Orton should fight inside a Steel Cage! But what about Triple H and Batista? They have already been inside Chambers and Cells, why not do something different. Make them climb a ladder! But make it bigger than that. Have Triple H state that they will have a 2 out of 3 falls match. The first fall is a first blood match, one of them has to make the other bleed. Then the second fall is a table match, one of them has to put the other trough a table. Of course it will go to a third fall, and that is when the belts are raise above the ring and they have to get out the ladders and one of them needs to climb up and get the belts. I would have Triple H get the sledehammer to bust open Batista in the first fall, but have Batista steal it from him and crack his face open with it to win the first fall. But then in the second fall, I would have Batista try to set Triple H up for a Batista bomb on top of the announce table, this would give Batista the win and the titles... but I would have Triple H reverse out of it and then Pedigree Batista face first through the announce table. This would cause them to be tied and need a third fall. You could have Batista bleeding when he gets out of the wrecked table. Then he could put Triple H through a table as well. Evening things up. Batista should just spear Triple H through a table leaning in the corner of the ring. But then Triple H and Batista climb the ladder, Batista up first going for the belt, his hand on it. But Triple slowing climbing the ladder with one hand, his other hand pulling the sledgehammer up with him. As Batista puts both hands on the belts, Triple H strikes him in the face with the sledgehammer. A lifeless unconcious Batista crashes backwards to the ring. Triple H pulls down the belts and is the winner! Now that's a good show!